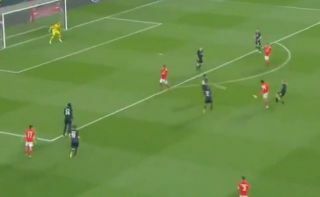 Benfica starlet Joao Felix is one of the most sought-after young players in Europe, and this is why as he bagged a superb goal in the Europa League on Thursday night. As noted by The Sun, Real Madrid, Man Utd, Man City and Juventus are said to be tracking the 19-year-old with a view of making a move this summer. However, it’s also added in the report that he currently has a £105m release clause, and so whichever club wants to sign him this summer, they’ll have to dig very deep into their pockets to snap him up. Nevertheless, if he continues to produce moments like this, there is little doubt that the interest will continue to build, as he scored twice in the first half to give Benfica a 2-1 lead over Eintracht Frankfurt in the first leg of their Europa League quarter-final tie. Felix has now scored 14 goals and provided six assists in 35 appearances at both youth and senior level this season, and he is certainly backing up the hype with quality displays such as this one to suggest that he would be a sensible investment.